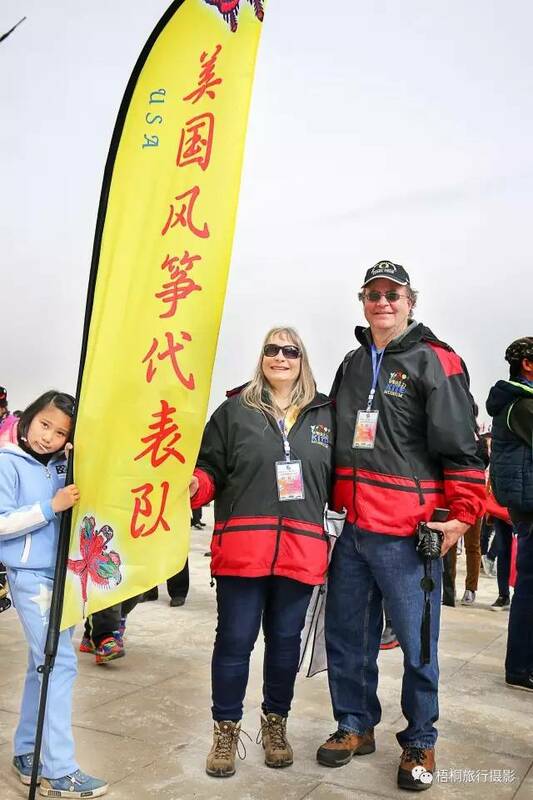 ← Return to the Weifang International Kite Festival 潍坊国际风筝节 after 30 Years! To arrive in the proximity of Longitude 94° East we had traveled over 1,000 miles west from Beijing to Dunhuang in Gansu Province at the gateway to the Silk Road and arrived at Dunhuang on April 7 to be there for the opening ceremony of the First Dunhuang International Kite Festival on Saturday April 8. Raising a banner that read “Mei Guo Feng Zheng Dai Biao Dui” (American Kite Delegate) in Chinese characters we carried our new identity and kites along with international guests carrying banners from Austria, Germany, Holland, Sweden, Malaysia, and one other American, Kent Lee from Los Angeles, who flew a giant Uncle Sam kite! Among the most memorable kites at the event were small traditional handmade and hand painted Chinese kites, the Shenzhen Women’s Stunt Kite Team, colorful Chinese centipede kites, and of course the gigantic inflatable kites in shapes from Cleopatra to Trilobites to Uncle Sam. 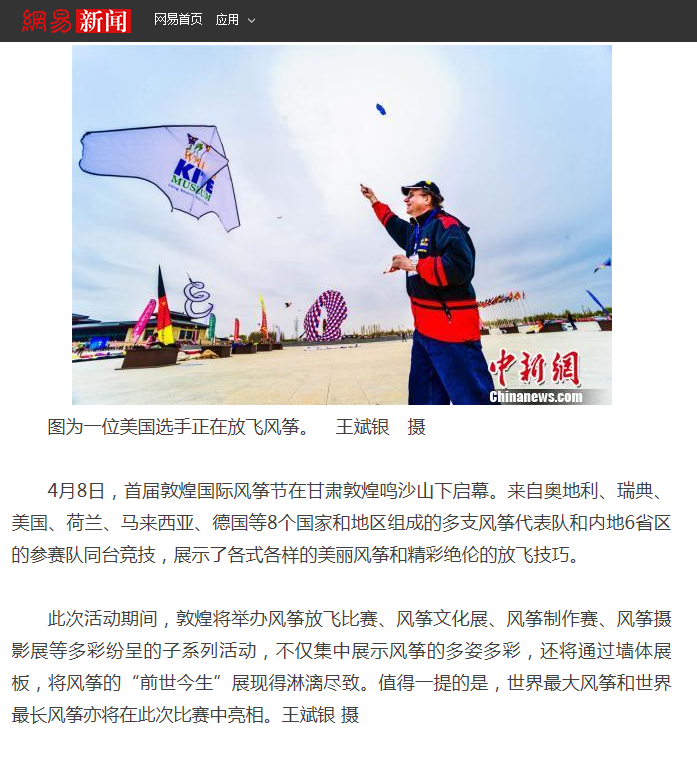 The City of Dunhuang also hosted a major kite exhibition in conjunction with the festival and is part of a program to promote the area’s Silk Road Tourism with international events in addition to promoting its major historical and cultural heritage sites such as the Mogao Caves. We received coverage on Gansu Television http://www.gstv.com.cn/news/folder63/2017-04-09/408780.html the Gansu Daily News as well as various news media from around China such as News.163 and others below. Dunhuang is located a little over 1,100 miles west of Beijing by air except in our case the Dunhuang Airport was closed for renovation and we flew to Jiayuguan and took a bus for last 230 miles to get to our destination. Our hotel in the downtown core was close to interesting market and other sites that tell the story of a city known for its historic connection to the Silk Road and a crossroads from the main route north from Lhasa Tibet to the north and on to Mongolia as well as from the ancient Chinese capital of Chang’an known today as Xian that was an age old destination for traders making their way across the western region of Xinjiang and the Taklamakan Desert that reaches out towards Kazahkstan. The winds that sweeping the vast plains of Central Asia or down from scenic mountains that frame the road to Dunhuang through the Hexi Corridor make Dunhuang a natural location for kite flying. The day after the festival our kite group toured the famous Mogao Caves and went camel riding along the sand dunes at Singing Sand Mountain at Crescent Lake, a picturesque oasis with a Chinese temple. Gallery | This entry was posted in China. Bookmark the permalink.